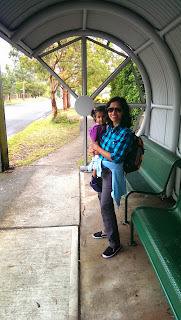 We woke up early to take the bus to Sydney and spend the day there. There was a slight drizzle but the weather was very pleasant. It was a short walk from our hosts' place to the bus stop, one that included tall trees, and a tiny bridge with a stream flowing underneath. It was like taking a really short but really beautiful hike. The bus came along merrily and we got on. Coming from a land of tap-in-tap-out, I was really surprised that the driver actually gave back change. Pau ka liau, as we say in Singapore. One person who does everything. In about half an hour, we had reached Sydney. It was to be a walking tour, and boy, did we walk a lot. We had not taken a stroller for Xena because we figured she was old enough to walk for a while and light enough to be carried thereafter. A sight we were not used to were the homeless people sitting at the street corners. I wondered what they did in the really cold months. There was a slight drizzle on and off, but in general the weather was wonderful. We walked past the Queen Victoria building and Xena was quite taken in by the statue in front of it, asking us "Yeh wali aunty ka kya naam hai?" 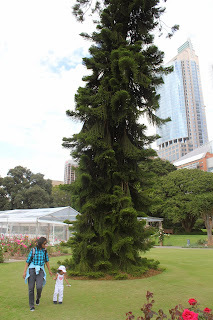 Our next stop was the famous Royal Botanic Garden, one of Sydney's top attractions. It was huge (30 hectares) and magnificent and everything tripadvisor had said it would be. The sprawling gardens and beautiful roses made me think of how much my green-fingered Dad would love going there. Some day, if I can pull him off his own backyard garden for a few weeks, I'd like to take him on a vacation too. I had taken Xena's brand new beloved Minnie Mouse sunglasses along, and she knew that. She couldn't wait to put them on. 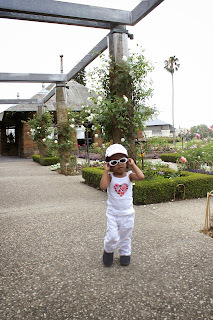 As soon as the sun came out, she asked for the sunglasses and sunscreen. Xena is ready to roam the gardens! We also saw some unusual-looking birds with long curved beaks. Our hosts told us later the bird is called an ibis. Xena and I trying to take a closer look at the ibises, but they kept running away. The ibis was not the only bird we saw. There was this beautiful rainbow parrot hiding in a tree, but I managed to get quite a clear photograph of it. The Wurrungwuri is a famous sculpture in the Botanic Garden. The word 'wurrungwuri' means 'this side of the water'. The part seen in the photograph above is made of 260 sandstone blocks arranged like a wave cascading towards Sydney Harbour. It doesn't look like it, but apparently the whole thing weighs 350 tonnes! The other part is a monolith made of 16,000 quartz pebbles, which contain boxes for small bats to roost in! In fact, the whole sculpture is meant to encourage native flora and fauna to move in and settle down. You can read more about its history and making here. We walked and walked and walked until we finally saw the iconic sail-shaped Sydney Opera House. Xena does an upside-down stunt for this picture. We take the steps up to the Opera House. We hung around for quite some time, and Xena was excited to see the very large ships. She even sat by herself for a few moments, taking in the scenery. My friend calls this her 'diva shot'. It wasn't very crowded so she had a lot of open space to run around. Dark clouds were gathering, making everything look even more dramatic. We sat on the steps for a while, munching on pringles. Many fearless seagulls approached us. Soon, we got hungry and headed to the Rocks Market nearby for some lunch. The market was busy, and there were several food and craft stalls. We had a little trouble finding something vegetarian for Viv and his dad to eat, but we finally found some Turkish wraps with a vegetarian filling. The visitor centre was right next to the market and we popped by to pick up some brochures. Here Xena is pretending to plan our itinerary. 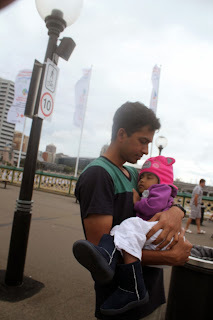 We decided to walk over to see the Harbour bridge. On the way, we saw a pair of street artists -- the golden dancing couple. Xena was fascinated. I passed her some coins to drop in the jar and she approached them cautiously, still wondering if they were real people or statues. Once she dropped the coins, the dancing man moved his fingers ever so slightly and showed Xena a thumbs up sign. She was delighted. Along our walk, we saw an Indian family with a pair of identical twins in a double stroller. And true to the stereotype, we saw a bunch of Asian tourists taking pictures with the twins! The parents looked seriously amused at the fact that their kids had also become part of the Sydney tourist attractions. The Opera House looked even more beautiful when clicked from the other side. Finally, we reached the Harbour bridge. The bridge itself is not that beautiful to look at. It really did look like a coat hanger to me, which is apparently its nickname. I suppose its history and symbolism is what makes it special. We had no intention to do the actual Harbour Bridge climb, for which you need to climb up really high, accompanied by experts, but there was a pedestrian access on which one could do a short walk from a lower elevation. But first, we spent a good hour inside the Harbour Bridge visitor centre. It had an awesome video documenting how the bridge was built, and an exhibition area with many quirky items and interactive displays. Father and son busy with the interactive displays. Please note their similar pose. 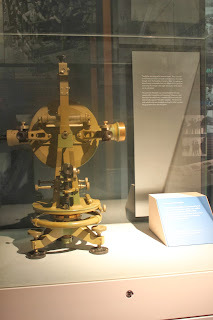 This instrument is called a micrometer theodolite and was used from 1925 to 1931 to make the precise measurements needed for bridge-building. Interactive displays included this one, which asked the user to guess the angle and virtually build the bridge. The wrong answers made the virtual bridge collapse. This is a model of the cable system that supported the bridge during its construction. A slideshow took us through facts about the bridge, such as this rather grim one. Sixteen men died during the building of the bridge. After having had our fill of the history and fun facts associated with the Harbour bridge, we took the pedestrian access to get the view from the top. Appa, Viv and Xena on the pedestrian access. There was even a guard there and I wondered if he had been stationed to stop suicidal people from jumping off the bridge. We saw these little locks all along the way. Wishes people had made? Promises of undying love? After the lovely and breezy walk, we came down to the street level and spotted a... pink ice-cream truck! It was cold and still drizzling lightly, but how can you see a pink ice-cream truck and not have ice-cream? Appa enjoying his ice-cream cone, while Xena takes off with Viv's strawberry milkshake! After all this, you'd think we were done. But we weren't. 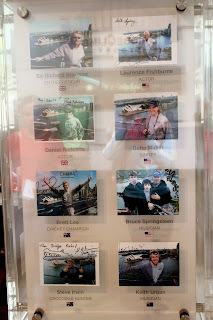 We walked over to Darling Harbour -- one of the most happening places in the area, with a lot of shopping, dining and entertainment options such as Madame Tussaud's and the Sydney aquarium. It was already naptime for Xena and she fell asleep as we were walking. 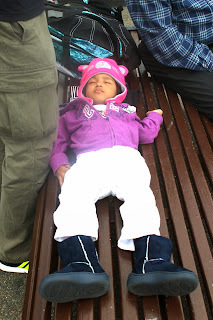 Our feet were hurting from all the walking we had done all day, so we decided to relax on a bench and let her sleep more comfortably too. There was even a hop on hop off ferry! Once Xena woke up, we went inside a mall for some souvenir shopping. One quirky and cute thing that Appa was doing was picking up a souvenir for himself at every new city. We had been craving some good ol' Indian food, so we found an Indian place and had naan, paneer, aloo baingan and mango lassi. All the malls had Christmas decorations and this one had a particularly cool one - a giant Santa climbing up the outside wall. We showed it to Xena who stared at it for a while, and without any warning, started crying. So we quickly rushed away. On the way back, we asked her why she had cried and she said "Because Santa fall down hone wala tha" (Because Santa was going to fall down). Oh, these dear dear children. We assured her that Santa was not going to fall down and she was okay after that.